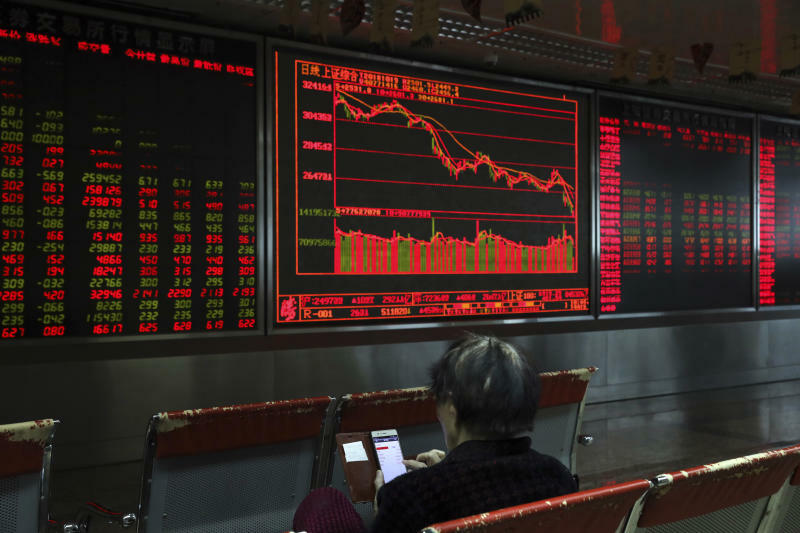 BEIJING (AP) — Global stocks were mixed Friday after data showed Chinese economic growth slowed more than expected but officials moved to shore up the country's markets. KEEPING SCORE: Germany's DAX lost 0.3 percent to 11,556 and France's CAC-40 sank 0.8 percent to 5,078. London's FTSE 100 was flat at 7,028 and Italy's FTSE MIB dropped 1.3 percent to 18,831 amid concerns about a spat with the EU over the country's budget. On Wall Street, the futures for the Dow Jones Industrial Average and for the Standard & Poor's 500 were both up 0.2 percent. ASIA'S DAY: The Shanghai Composite Index rose 2.6 percent while Tokyo's Nikkei 225 shed 0.6 percent to 22,532.08. 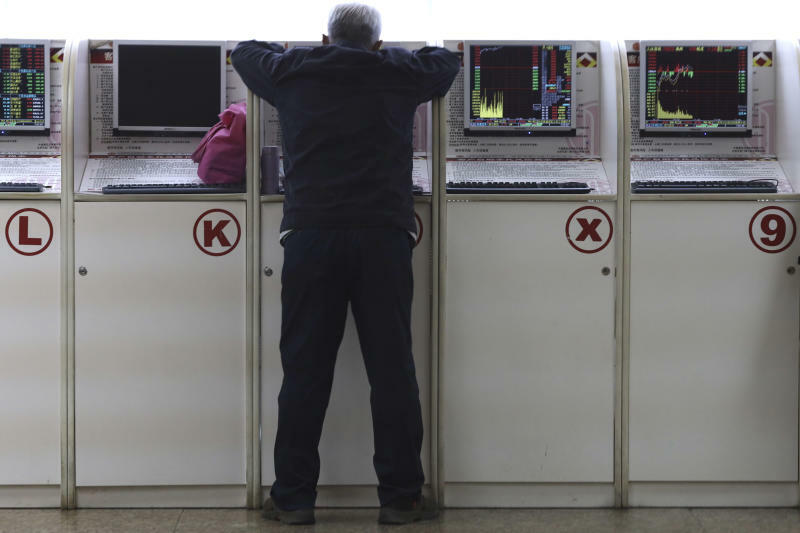 Hong Kong's Hang Seng advanced 0.4 percent to 25,561.40 and Seoul's Kospi added 2,156.26. Sydney's S&P-ASX 200 shed 3 points to 5,939.50 and India's Sensex sank 1.5 percent to 34,242.73. Manila rose while Taiwan, New Zealand and other Southeast Asian benchmarks declined. COOLING CHINA: Growth in the world's second-biggest economy sank to a post-global crisis low in the quarter ending in September. The downturn adds to pressure on communist leaders as they fight a mounting tariff battle with the United States. Retail spending and investment, key economic drivers, slowed. Finance officials launched a media blitz to reassure investors about the health of a stock market, which has tumbled 30 percent since January. "Economic fundamentals are good," the central bank governor, Yi Gang, said. Liu said the decline in share prices created "good investment opportunities." The government also said insurers will be allowed to create products to help stabilize the market by reducing "liquidity risk." ANALYST'S TAKE: "The markets continue to shudder as political turbulence ferments," said Stephen Innes of OANDA in a report. 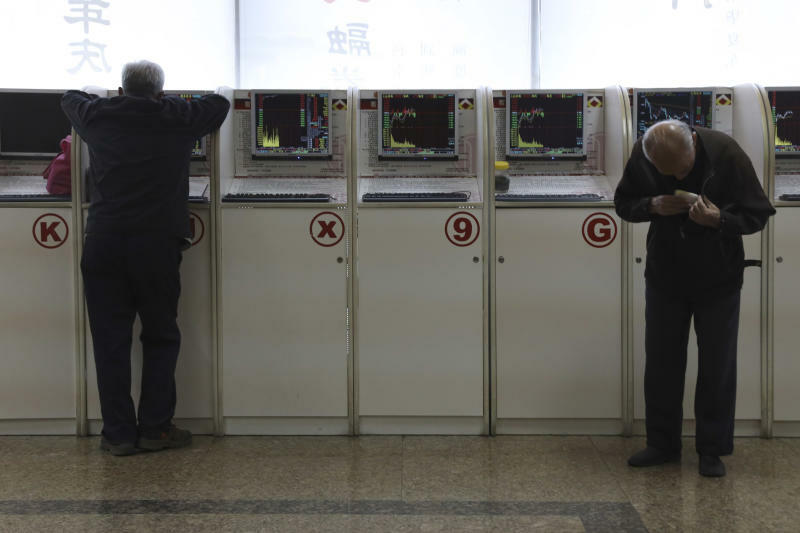 The Chinese data "offer little solace to risk sentiment," Innes said. "There are worrying signs beyond the tariff effect that are more concerning," including weaker factory output. ENERGY: Benchmark U.S. crude rose 43 cents to $69.08 per barrel in electronic trading on the New York Mercantile Exchange. The contract fell $1.10 on Thursday to $68.65. Brent crude, used to price international oils, gained 72 cents to $80.01 in London. It retreated 76 cents the previous session to $79.29. CURRENCY: The dollar gained to 112.40 yen from Thursday's 112.17 yen. The euro rose to $1.1466 from $1.1453. Is Shiloh Industries, Inc. (NASDAQ:SHLO) Trading At A 46% Discount?